While planting the onion starts we have been growing this winter we discovered quite a few large carrots who had been in the ground since last season. Vibrant neon red and purple carrots, that look delicious and ready to eat. Just another reminder that leaving root vegetables in the ground is a natural and easy way to store them over the winter. We seem to have an unlimited supply of Nanking Cherries this year from two older shrubs (Prunus tomentosa). We have been harvesting as quickly as possible and many of them have been canned as juice or jam. This extremely hardy shrub is a heavy producer and very drought tolerant – it is a great option for attracting wildlife and bees. Very exciting to see so many things coming to life this spring. Lots of food growing right in the swales of our food forest. These choke cherries went in last year and I wasn’t sure they had survived, but they are coming back with vigor this spring. They are native to the area, so I expect them to do well. The deep straw bedding we use for our ducks reached a compacted 18+ inches by spring. Much of it is composting already, and it is full of duck “fertilizer”. Here you can see the swales in our food forest after spreading the bedding out across them. Our ducks seem to generate exactly the amount of used bedding required to cover our swales – perfect. 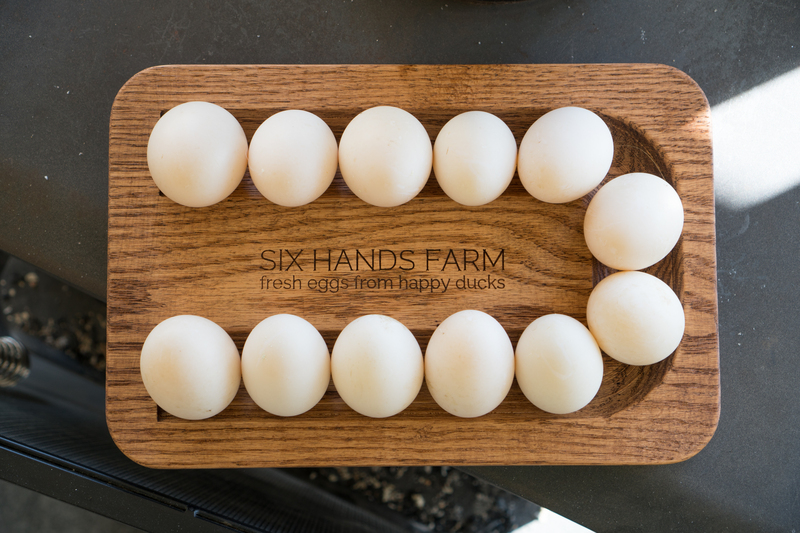 Our seemingly unending duck egg supply led to a fun project today. 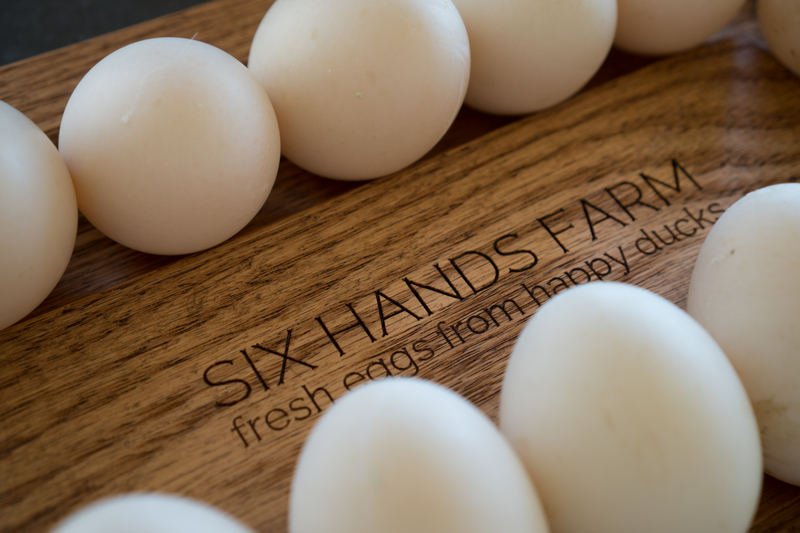 This egg holder is cut from solid Oak with a smooth channel the hold a dozen or so eggs, and a Six Hands Farm engraving. A little stain helps the lettering stand out. 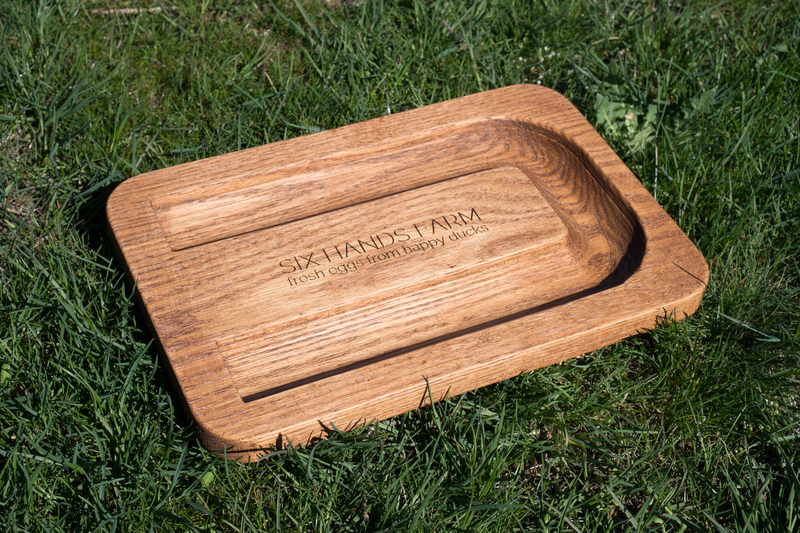 The channel is nicer than individual holes as it allows you to slide the eggs forward as you place the newest ones at the back each morning. I try to do periodic aerial video captures to keep a record of how things grow and evolve throughout the seasons. Here are some shots of our January snow around the property. Over the fall I designed and built a shelter for our ducks in the corner of our food forest. By placing it at the highest elevation in the food forest I am able to easily drain “enriched” duck water into the downhill swales each day. The bulk of the structure is pressure treated 4×4, likely overkill, but I had extra posts from a fencing project ready to use. I used a technique for notching and assembling the posts which was new to me, but that I am very happy with. The posts are notched together at all joints allowing easy fastening with 3″ lag screws. The notches are made by simply kerfing the lumber with a circular saw set to a depth half the thickness of the post. I cut every half inch or so, then simply knock out the notch with the claw of my hammer. Very efficient and fast to do in the field. Example of a kerfed and knocked out notch. Floor framing almost complete, all interlocking beams. 2×4 roof framing and corner beams in. Walking in the door, you first pass a ramp over 2 foot of double meshed floor which will allow drainage from water containers and keep water separate from the deep straw bedding. A later shot with the door open, and the ducks all moved in.